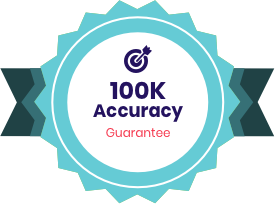 We guarantee our software is 100% accurate and gets you your maximum refund. If not, we'll refund your software costs and pay any difference in your lower refund or higher tax liability, plus cover any legal or audit costs up to $100,000. 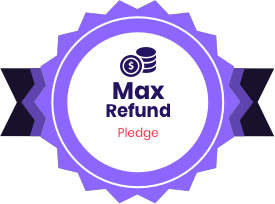 We guarantee our software is 100% accurate and will calculate your maximum refund under applicable law. If an error in our software results in your ultimately receiving a smaller refund or larger tax liability than you receive using the same data with another tax preparation product, we will pay to you the difference in the refund or liability (up to $100,000) and refund the applicable software fees you paid us. If the IRS or a state taxing authority audits you and imposes any penalties or interest on you due to an error in our software, we will reimburse you for such penalties and interest and any reasonable, documented audit costs you incur (up to $100,000) and refund the applicable software fees you paid us. This guarantee only extends to returns that are e-filed by taxpayers preparing their own tax returns using our Consumer 1040 products (e.g. those located at https://www.taxact.com/taxes-online) starting in the 2017 tax year. Our other offerings (including, without limitation, our products for small businesses (Business) and tax professionals (Professional)) as well as our Consumer 1040 products for past tax years have their own guarantees and are expressly excluded from this specific guarantee. This guarantee only applies to errors contained in our software, and does not apply to errors attributable to the user, including without limitation if a user: (i) overrides any amounts generated by the software, (ii) misclassifies or fails to enter any information completely or accurately, (iii) makes willfully incorrect or fraudulent claims, or (iv) fails to file an amended return after we announce any updates or corrections to the software. Current and former employees of TaxAct or any other company offering tax return preparation products are excluded from this guarantee. This guarantee sets forth your sole and exclusive remedy, and our only obligation, in the event of any errors with our software. In no event will our total, cumulative obligation to any customer under this guarantee exceed $100,000. To make a claim under this guarantee, you must click here within 60 days from the date you e-filed your return or within 30 days of the IRS or state imposing a penalty, and provide any information we request to allow us to evaluate and verify your claim. Once we receive your claim and the necessary information, we will review it and respond to you within 90 days.